A Halloween treat idea, featuring Halloween Cocoa Krispie Treats, candy corn, and festive sprinkles. I can recall the excitement of Halloween building up in me as a child long before the holiday actually arrived. What would I be this year? What would suit me best now that I was one year older, and so much more sophisticated than last year’s me? The school day would be full of festive activities, and the whole day seemed to be one big party that would continue all the way into the night. 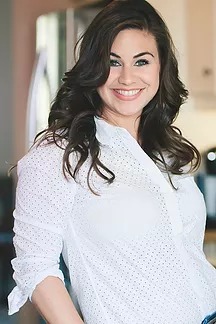 Yes, I would have to say Halloween is mostly for the kids, and what better way to kick things off than with a special kid-friendly Halloween treat? 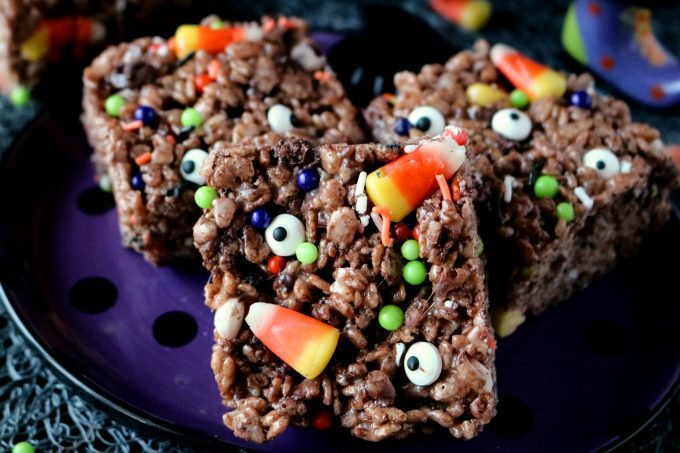 A Halloween Cocoa Krispie Treat to be more specific. I wanted a fun and festive Halloween sweet I could easily make-ahead of time, and send with my kiddos to school for their class party treat. And if ever you’ve made Rice Krispie Treats at home, you know that desserts just don’t get any easier than that. Just a moment of melting marshmallows on the stovetop, a tidbit of stirring and bing-bang-boom, you’re done. 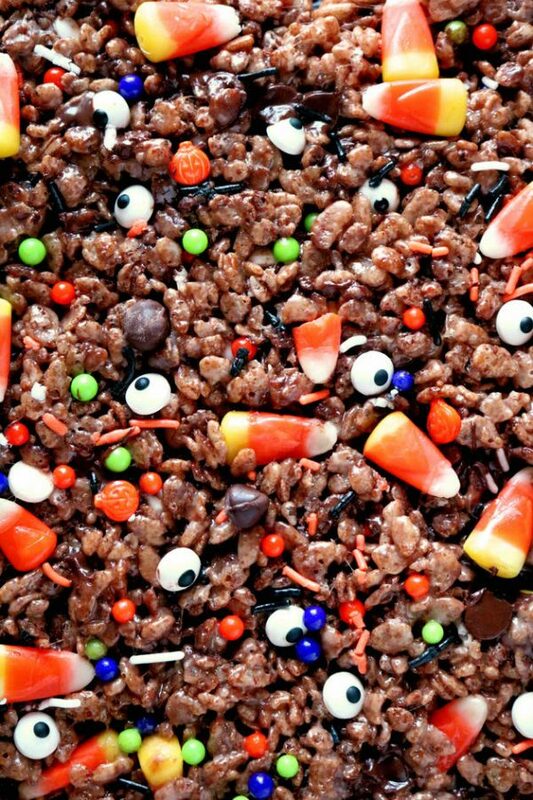 With candy corns and Halloween colors in mind, I decided to go with the Cocoa Krispie version instead, as traditional Halloween colors like orange and purple would pop vividly against the dark brown cereal, and make for an eye-catching and festive treat. 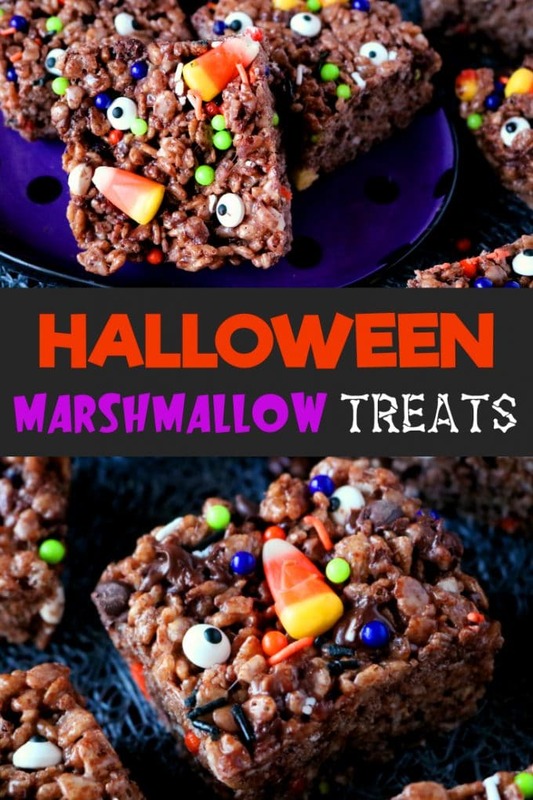 In creating the recipe, I kept in mind the Halloween Cocoa Krispie Treats would make for a much sweeter marshmallow treat than the original version. Adding just a touch more salt, as well as some semi-sweet chocolate chips, would bring just the right amount of balance to the bar. Surely all you chocolate lovers out there wouldn’t mind the alteration, and for a fact, my children certainly didn’t miss the old-fashioned Rice Krispie Treat. They could not wait to get their precious little hands on this Halloween party treat, and beamed with pride at the thought of serving them to their classmates. 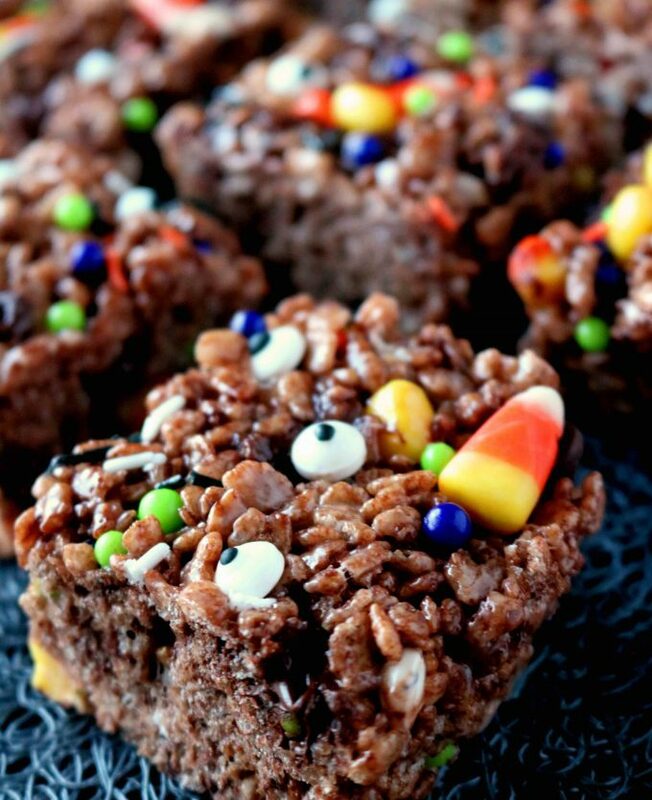 Whether you are whipping these up to ship off to school, serve at your very own Halloween party or just indulging in a festive dessert for yourself, these Halloween Cocoa Krispie Treats are the perfect way to ring in the holiday. 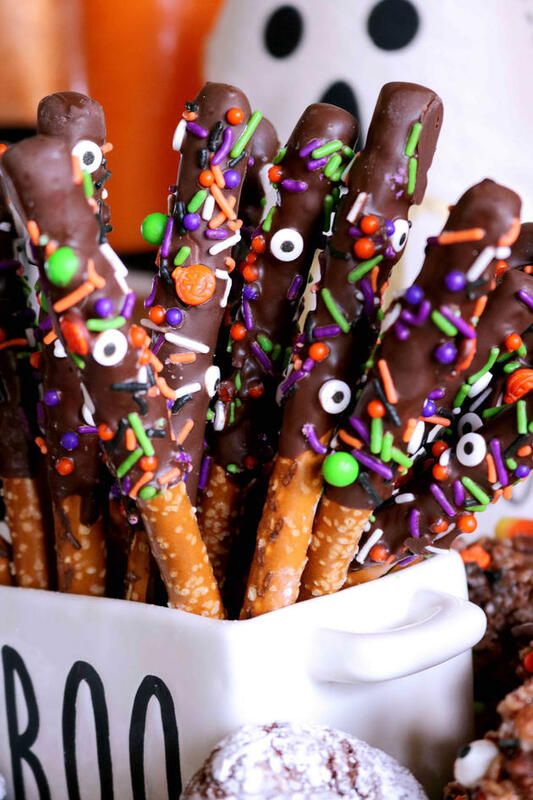 And if you like these little gems, you will absolutely adore these Halloween Pretzel Rods, complete with a generous dip in chocolate and sprinkled with candy eye decals and festive Halloween sprinkles. And for a complete list of Halloween treats, sweet and savory, check out all of these stellar Halloween recipes, perfect for your party! Have ready a greased 9x13" casserole dish. Combine the mix-in's in a bowl, and set aside until ready to use. Place a large sauté pan over medium-low heat and add the butter. Once the butter has melted, add the marshmallows and increase the heat to medium-high. Allow the marshmallows to melt down, stirring often. Once the marshmallows have melted, stir in the salt and vanilla extract, followed by the Cocoa Krispie cereal. Once the cereal is coated in the marshmallow mixture, add in the majority of the mix-in's, reserving about a 1/3 cup for topping. Stir to combine. Transfer to the prepared dish and using your hands (lightly greased with butter), roughly pat out the mixture to form a flat surface. Sprinkle the remaining decals evenly over the dish, and gently pat to set. Allow the treats to cool completely, about 45 minutes - 1 hour. Then, cut into squares, serve and enjoy! So crafty, fun, and delicious. Going to make these every year! Thank you, Megan!!! SO MUCH!